Are you aware of today's hectic lifestyle? Today's lifestyle is full of rat race, busy schedule, workload, tension, stress and anxiety. And, this often leads to sleep deprivation. Lack of proper amount of sleep in the individuals is known as Insomnia. When a person fails to get the adequate amount of sleep in their lives, he is said to be suffering from the sleep disorder, Insomnia. WHAT ARE THE FACTORS THAT GIVE RISE TO THE COMPLICATION, INSOMNIA? There are a lot of factors, which contribute to the occurrence of insomnia. These are psychological, emotional, environmental or medications. Chronic health complications like arthritis, kidney disorder, cardiological disorder, hyperthyroidism, asthma, Parkinson's disorder. 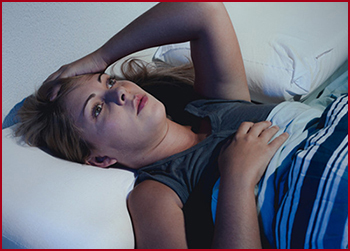 Transient insomnia generally lasts for one night or a few weeks. But, if this situation of transient insomnia often occurs, the complication is known as intermittent insomnia. And, chronic insomnia often lasts for minimum a month or even more. Risk of chronic disorders like heart disorders, nervous breakdown and other physiological complications. It is a sub dosha of Pitta, which is symbolized by Fire. It is present in the heart. It has a control over the desire, emotion, spirituality and decisiveness. The imbalance of this dosha often makes an individual workaholic and demanding. This leads to the condition of insomnia. It is a sub dosha of the Kapha. This is symbolized by water. This dosha helps in nourishing the brain right from the cellular level. Imbalance of the dosha leads to lack of proper nourishment of the brain cells. This often leads to lack of sleep. It is a sub dosha of the dosha, Vata, which is symbolized by Air in Ayurveda. This dosha leads to a sensitive nervous system, which often gives rise to worries, depression, anxiety and many more. The aggravated form of this sub dosha gives rise to insomnia. Insomnia, or Anidra caused due to the vitiation of the three doshas or a single dosha can be treated with the help of various Ayurvedic herbs. These herbs help in maintaining the overall well being of the individuals by involving a healthy diet and lifestyle along with the herbal remedies. 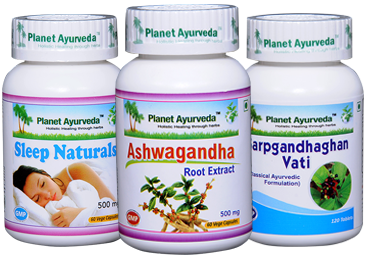 The global manufacturer of herbal formulations, Planet Ayurveda is the leading company in its niche. It is known for its purely vegetarian medicines, which are free from additives, chemicals, fillers, artificials, salts, sugars, colors and many more. It is completely natural and do not have any side effect at all. It provides a powerful herbal pack with the various herbal supplements, which are extremely safe to use. The Insomnia Ayurvedic Supplements make use of the following three herbal formulations in a synchronized manner. These formulations are very effective and have a lot of medicinal properties as well. These medicines, when consumed in proper doses as recommended, work together to provide a healthy sleep devoid of physiological complications as well. The Pack contains the following herbal medicines. These capsules are manufactured from the standardized extracts of the herb, Ashwagandha. This herb is scientifically known as Withania somnifera. It has a lot of health benefits. It has alkaloids, steroidal lactones. It helps in maintaining the vata doshas of the body. And, it helps in having a wonderful sleep to the individuals. These capsules form a superb herbal supplement for maintaining a healthy and wonderful sleep. Dose: 2 capsules twice daily with water after meals. This herbal medicine is a natural supplement made from the pure extracts of the Sarpgandha extract. It is scientifically known as Rauwolfia serpentina. This herbal medicine is extremely beneficial for having healthy sleep. It helps in maintaining healthy body and mind as well. Dose: 1 tablet twice daily with water. Dose: 2 capsules with water before sleep at night. Ayurvedic Supplements along with proper recommended diet and a healthy lifestyle help in alleviating sleep disorders and insomnia to a huge extent. These help in eliminating the symptoms of the disorder as well. Also, these herbal supplements help in eliminating the complications involved with insomnia and sleep related disorders to a huge extent. Thus, follow the dietary practice along with the recommended herbal remedies of insomnia as proposed by Planet Ayurveda to eradicate all the complications related to sleep deprivation and lead a healthy life. 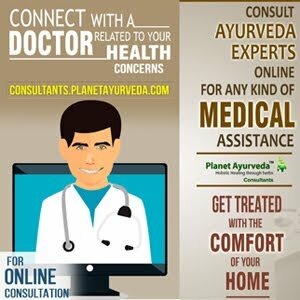 Live a happy life with Planet Ayurveda! !